1. Heat oven to 350°F. 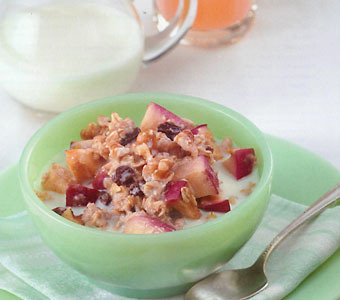 In a 2-quart casserole, mix oats, raisins, brown sugar, connamon, salt, 4 cups milk and the apples. 2. Bake uncovered 40 to 45 minutes or until most liquid is absorbed. Sprinkle with walnuts over top. Serve with additional milk. 300 Calories; 80 Calories from Fat; 9g Total Fat; 2.5g Saturated Fat; 0g Trans Fat; 10mg Cholesterol; 130mg Sodium; 45g Total Carbohydrate; 5g Dietary Fiber; 24g Sugars; 10g Protein. 4% Vitamin A; 0% Vitamin C; 20% Calcium; 10% Iron. 1 1/2 Starch; 1 Other Carbohydrate; 1/2 Low Fat Milk; 1 Fat.